I have been blogging for nearly 3 whole years and within those three years I have seen many negative comments towards Mummy bloggers. When I started blogging I primarily did it because I wanted to write about family days out with my partner and the girls, write their monthly update and just something to look back at once the girls and I are older. I didn't really think about what kind of blogger I wanted to be. It just came naturally that I was a Mummy blogger as that is who I am. I have been a Mum for just over 6 years and my life has completely changed since I fell pregnant at 16 and I do not regret any of it. Many non-bloggers and even other bloggers out there think that all Mummy bloggers 'think they know everything' and making other Mums look bad. That is not the case. Many Mummy bloggers do write parenting tips and advice. I do myself. The reason I write tips and advice for other Mums and Dads is because I like to think that I may of helped another parent who needed help, such as potty training or going through the toddler tantrum stage. Every single tips and advice post I wrote are my own opinions and my own experience. I don't expect all parents and non-parents to agree with my tips and advice posts because we all bring our kids up different ways. So why a Mummy blogger? As I said above, it just came naturally for me to write a parenting blog. I have never been a make up fan, not very good with clothing fashion or crafts etc, what I do know about is parenting. I know what it is like to bring up one and two children. I know what it is like being pregnant and bringing a child up at the same time. I know what it is like to fall in deep with pre-natal and post-natal depression. I want to share my story. This blog is my space on the net and I want to share my stories with my readers. Maybe one day my story or tips and advice page will help another Mummy (or Dad) out there. I will never stop blogging if I ever got a negative comment about being a Mum blogger. I am so thankful for my blog. My partner, girls and myself have done so much the past three years, all down to my blog. My blog is my hobby and my part-time job. If I want to blog about my girls, parenting tips or any other Mummy topic, then I will. Some of you may not like the idea that there are 'Mummy' Bloggers out there, but many other people do. I am proud to be called a Mummy/Parenting Blogger. And so you should be proud. Your blog is lovely and such a wonderful thing for your girls to look back on when they're old. I'm a mum and have a blog so really have no issue with the 'mummy blogger' title but it does some to come with a bit of negativity. Stuff them!! I love been a blogger I do work part-time as a Dental Nurse and have two kids so trying to fit all this in is very hard. Best think I have done is doing my blog too. Congrats on blogging for three years hun, your blog is fab. Please ignore the negative comments towards mummy blogging, I find it a great use of my time and brain, it's a little bit of me time. I think we all have advice to share that can hit home with some, but not all, and that's perfectly fine! If even one person can relate and be helped, it's a good thing, right? You should be proud! There is so much judgement from other people, but I think people should judge less and support more! I think bloggers in general get many bad comments, not just mummy bloggers, so at least you're not alone! 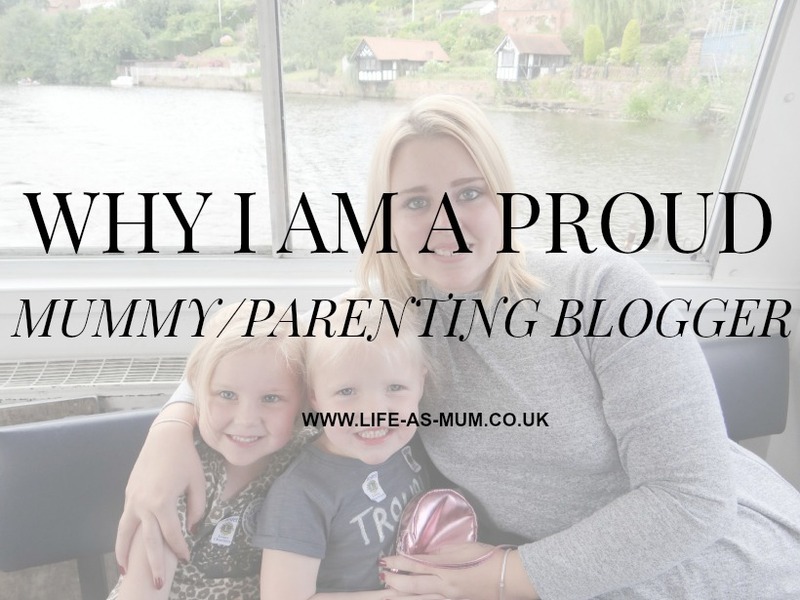 Great post, you should be proud of everything you do :) I think as with any community, there are a few who spoil it for everyone else, but overall mummy bloggers always seem like a nice group! I think it's great that there's a niche for parent bloggers. I've seen a lot of bloggers make the transition once they have children. It works. Fancy a read? Why not have a read of my latest post : Butterfly Twists fold up shoes review. . I think Mummy bloggers should be proud of what they've done. If they're proud of their blogs why not? They've got a lot of sway and let's face it, why shouldn't they be as respected as other bloggers. Personally I'd rather read a mummy (or daddy) blog than a beauty or fashion blog which is much more samey. I must admit I don't ever refer to myself as a "Mummy blogger" much preferring the term "Parent Blogger" - there's something a little patronising about "Mummy blogger" to my mind. You just keep doing the awesome creativity that you do and pay no mind to what anyone else says. Fortunately I've not encountered any negative attitudes towards Mummy bloggers, although I was taken aback once to be called one myself in the introduction of a PR email! I'm proud to be a mummy blogger too. I think people will be criticised whatever they do, so leave the haters to it! I think being a Mummy blogger is a fabulous thing. I wish blogs had been about when I had my children nearly 20 years ago! Not everyone will like it but then that is their concern at the end of the day! I have literally just today shared with my extended family that I am blogging as I was worried about peoples reactions but do you know what, if they don't like it they don't have to read it! It's a shame that some people don't like mummy blogs, I for one like them and read them lots even though I am not a parent yet. You should definitely be proud. Think of all those memories you've documented for later years, it's lovely!